Let's face it: cocktail bitters are expensive. If you want an assortment of flavors, it's going to cost you. Here's the perfect way to have all the basics: orange, aromatic, Orleans, and celery. For less than 30 bucks! 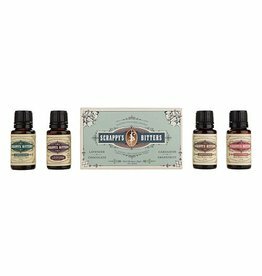 When you're ready to start experimenting with "adventurous" flavors of cocktail bitters (and you don't want to break the bank) Scrappy's has a set of 4 mini-bottles to the rescue: lavender, chocolate, cardamom, and grapefruit.